How did Thomas Edison grow up to be a legendary inventor? Our main selection explores Edison's life as a child. We learned about his interest in mixing chemicals--sometimes with explosive results--and his work as a paperboy in his community. 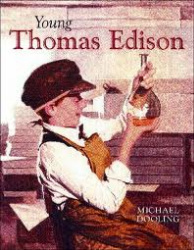 Here is a link to the 1940's movie a Young Thomas Edison. It is a classic in black and white and a little different than our story, but a great movie to show Thomas Edison's drive to be an inventor.